WEST FARGO, Minn. – Through the Direct Your Dollars™ program, the youth ministry program at Holy Cross Catholic Church recently received a $1,000 donation from SpartanNash. Direct Your Dollars is offered at more than 150 SpartanNash-owned stores in nine states – including all four Family Fare Supermarkets in Fargo, West Fargo and Moorhead – and gives store guests a way to support their favorite local charities, schools and nonprofit organizations. 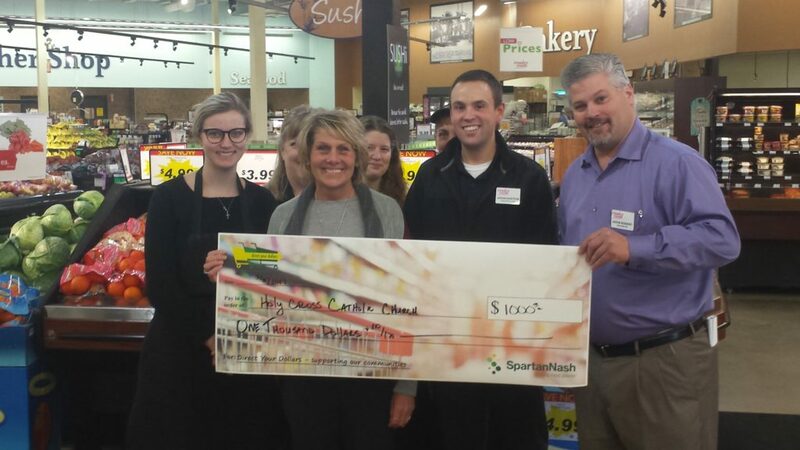 West Fargo Family Fare Store Director Jason Bossert presented the $1,000 check to Holy Cross Catholic Church Director of Religious Education and Youth Ministry Brenda Mears on behalf of SpartanNash and the Direct Your Dollars program. The money will help fund Holy Cross’ annual youth mission trips, including purchasing construction supplies, food, clothing and much more for people in need. “Over the past few years, our youth group has traveled to various places throughout the United States to aid local churches, ministries and community organizations,” Mears said. “Our youth group has served through construction projects, children’s ministry, evangelism, community development and much more. We are thankful to SpartanNash and its Direct Your Dollars program, because it will enable us to purchase construction supplies, food, clothing and much more for people in need.